Curiosity and quest for the unknown – Deutsche Neurowissenschaften-Olympiade e.V. 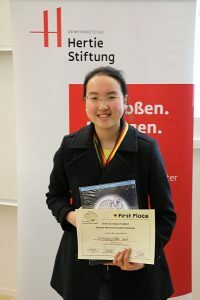 Yingning Lu is the winner of the 2018 Frankfurt Regionals Deutsche Neurowissenschaften Olympiade. She had to prevail over 25 other young talented students. Originally from China, she lives with her family in Germany since 3 years where she attends the Schloss Hansenberg boarding school. Since she was a little child, Yingning was always enthusiastic about natural sciences and now is sure that she would like to study science after high school. In her spare time, she enjoys reading and doing yoga or swimming. Yingning also takes part in many voluntary science courses, such as neuropsychology for example. And it was during her neuropsychology course that begin her keen interest in neuroscience. When a friend of hers, who had participated in a DNO event the year before, told her about the competition, Yingning immediately registered. She did not think that she would win. But now her ambition is packed, she wants to learn more and understand more about neuroscience and the brain. Yingning says, “I just enjoy it,” and one can believe her just by seeing her smile. Yingning likes dealing with the non-reality. In physics and mathematics she seeks and finds the perception that does not exist in nature. She says “it always much fun to discover uncertain things”. She finds this very fascinating, which is why she chose both subjects at school as an optional field of study. DNO was not this young ladies first Olympiad in Frankfurt. In this city, she previously took part in a mathematics competition. And that is not all, she has also participated in other competitions, such as piano, painting and finances. She likes the city very much and she can imagine studying science in Frankfurt. Yingning Lu has many interests and is full of ideas. We are sure that talents like her will be a big win for the natural sciences. We are happy to have met Yingning so early on her way. With her good mood and her ambition there is surprise that she also performed well in Heidelberg our DNO Nationals event. We can’t wait to see what Yingning achieves next as she continues on her path of academic excellence. Maureen is a sixth-semester med-student at Goethe-University Frankfurt/Main, Germany. 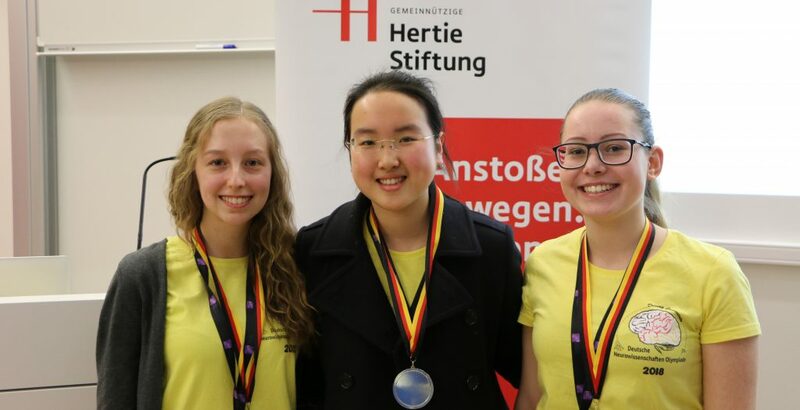 After she participated as a student at the formerly named “German Brain Bee” competition in Heidelberg 2015, she become fascinated with the field of neuroscience. This was her breakthrough, and since then she wanted to give more students the opportunity to experience the Neuroscience-Olympiad. Therefore, she together with LaShae Nicholson and other students have established the DNO-Frankfurt e.V. team.